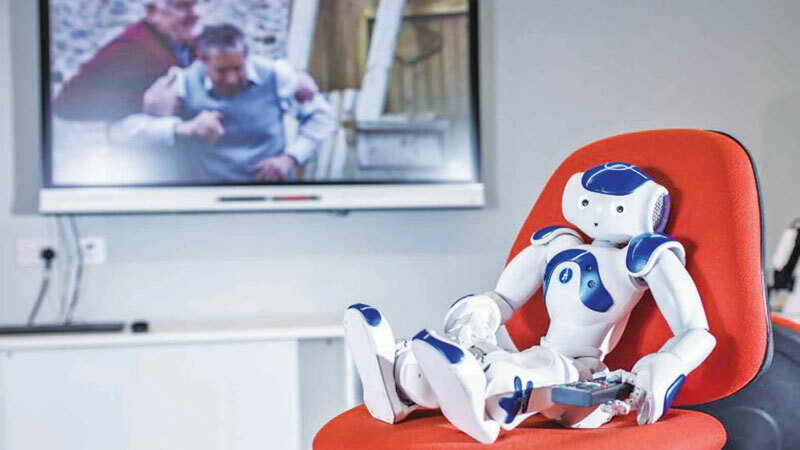 A soap addicted robot is set to help dementia patients by binge watching hit comedy Friends and popular soap Emmerdale. Robbie the Robot – who took two years to build by a university lecturer and his students – is thought to be the first of its kind. After being completed this year, Robbie has spent the last few weeks watching 13 episodes of the soap, Emmerdale, in a bid to help him recognise different facial expressions and body language. And Robbie has made great progress by already spotting signs of aggression or depression. It is hoped that in the future he’ll be able to recognise common symptoms of dementia to alert a GP or care worker. Designer, Ardhendu Behera, a computer science lecturer at Edge Hill University, Ormskirk, Lancashire, claims he can now recognise 80 human actions and emotions despite only launching their project in 2017. Robbie is already able to play music when detecting a dementia patient is in distress in a bid to calm them down. He is also able to track a patient’s overall well-being to ensure he can react to distressing circumstances before they occur. Robbie is about to be part of another project where he is going to binge on ‘Friends’ to study group interactions and activities.